Discusses the key concepts and values of the Christian faith, exploring how prayer, partaking of the sacraments, and raising Christian children can be life-affirming practices. In April 2007, I attended a weekend lecture series by Marcus Borg, PhD - Christian author, historical Jesus scholar, and professor - called "Intentional Christianity: Sharing God's Dream.” On Friday night he spoke on “A Tale of Two Christianities,” which included information from his book "The Heart of Christianity." He provided notes as handouts and encouraged us to spread them about freely, so I will include them here as an introduction to his book. The two Christianities referenced in the title are what he calls the earlier Christian paradigm, or belief-centered Christianity, and the emerging Christian paradigm, or transformation-centered Christianity. Earlier Paradigm – Being Christian is about believing; faith as believing. Emerging Paradigm – Being Christian is about a way, a path; faith as centering in God. Followers of the two paradigms differ sharply in ways of seeing the origin, authority, and interpretation of the Bible. Earlier Paradigm – Origin: a divine product. Comes from God as no other text does. Emerging Paradigm – Origin: A human product. The product of two ancient communities. Regarding the emerging paradigm interpretation of the Bible, Borg quoted someone as saying, “The Bible is true, and some of it even happened.” Borg says that literal interpretation of the Bible may be the greatest factor in people leaving the church. 1. The Spirit of God can and does work through the earlier paradigm, and has for millions of people. But there’s a lot of static in it. For millions, it has become an obstacle, a stumbling block. 2. The emerging paradigm is not primarily an accommodation to modern thought, not a reduction or abandonment of the Christian tradition. Rather, it is “neo-traditional.” Neo: it is new – we haven’t seen exactly this form of Christianity before. It is traditional: it is a recovery, a retrieval, of what was most central to Christianity–God, Jesus, the Bible, “the way”–before the distortions created by the collision with modernity. We’ve looked at the differences between the earlier and emerging paradigms. So what do they have in common? Borg outlined three areas of shared thinking. 1. At the heart of Christianity is God/The SacredGod: Christianity without a robust affirmation of God makes no important sense. Christianity shares this in common with the world's enduring religions. 2. At the heart of Chrisitianity are the Bible and Jesus. They are the two primary sources of revelation for Christians. This is what distinguished Christianity from the world's other religions. The Bible is the Word of God expressed in human words. Jesus is the Word of God embodied in a human person. For Christians, Jesus is the decisive revelation of God, of what can be seen of God in a human life. When Jesus and the Bible conflict, Jesus is decisive. The way, the transformation, is both personal ("born again" through "dying and rising with Christ") and political ("the kingdom of God" and "Jesus is Lord"). The way is lived within Christian community and tradition. I wish I could give this book to all of my friends and tell them "Read this, and you will understand the way I see Christianity." Borg so eloquently describes a way of relating to God that does not ask for the abandonment of logic and religious pluralism. I know that it will take me many more readings of this book to be able to take it all in, but Borg comes the closest I've seen to describing the hugeness of a personal relationship to God. When seen outside of a literal-factual interpretation, the scope of Christianity becomes accordingly enormous, and Borg breaks it down with relentless clarity and precision (and examples, even). This is the best of the books we have read and discussed in our small group. What Borg says makes sense. It's thought-provoking and well written. I keep going back and going back to this book and I'm using a great deal of what Marcus Borg says in relation to how be can do something in a sacramental way. Excellent book. 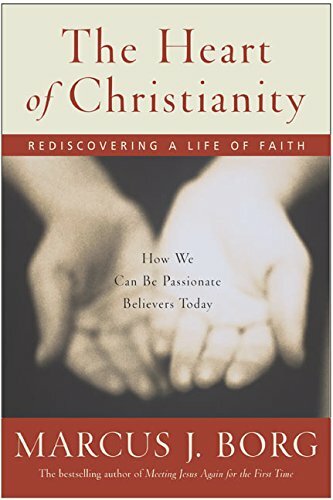 Borg offers an emerging view of Christian faith and Christian life for today. In getting to the heart of matters, Borg says, "Salvation is about peace and justice within community and beyond community." Interesting way to communicate theology through story-telling. A good read.